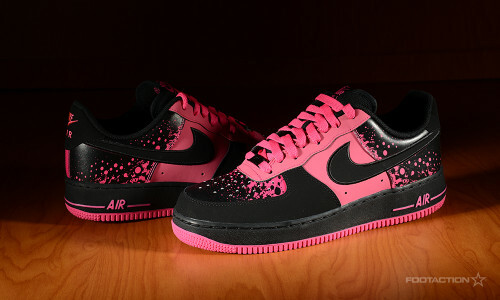 The Nike Air Force 1 Low Pink/Black is reminiscent of the Air Tech Challenge II with its splattered graphics on the back panel as well as the vivid pink colorway. It’s difficult not to associate this sneaker with the Agassi signature, noting all the brand is doing with the line as of late. This edition of the Nike Air Force 1 Low arrives with the construction materials of nubuck and leather. Print article This entry was posted by hhcblog on February 7, 2014 at 2:39 pm, and is filed under Footwear. Follow any responses to this post through RSS 2.0. You can leave a response or trackback from your own site.